Today is the final day of 2015. It wasn't a bad baseball year at all, and certainly better for the Twins than the previous four. They signed Korean slugger Byung Ho Park to, in a roundabout way, fill the lineup gap opened by Torii Hunter's retirement. Bullpen: Casey Fien, Kevin Jepsen, Trevor May, Ricky Nolasco, Glen Perkins and probably two others, at least one a lefty. The bench is a bit up in the air, but either Suzuki or Murphy will sit when the other catches, and Eduardo Nunez and Danny Santana are likely to have jobs. That leaves one spot, probably for an outfielder. Obviously, this outline presumes that Buxton is the center fielder. I believe that's the best route, and I believe that's how the Twins will break camp. Last summer the players union and the commissioners office agreed on a domestic violence policy that gives the commissioner a great deal of latitude in suspending a player (and sets up an appeals process with an independent arbitrator.) Three cases have emerged this offseason at initial tests of the new policy, involving Yasiel Puig of the Dodgers, Jose Reyes of the Rockies and Aroldis Chapman, now of the Yankees. comes at a crucial point in Chapman's service time. As detailed here by Sports Illustrated's Jay Jaffe, a suspension of more than 40 games will push back Chapman's eligibility for free agency a year, giving the Yankees control of his contract in 2017; a suspension of less than 50 games will effectively deem Chapman's misadventure less serious than steroid use. That it's the Yankees with Chapman now and not the Cincinnati Reds further heightens the scrutiny on Rob Manfred. Just as there were suspicions that the Alex Rodriguez suspension was handled in a manner calculated to please the Yankee ownership, which wanted out from A-Rod's contract, there are suspicions that Chapman's case will be handled in the Yankees favor. And what would that be? A suspension between 40 and 50 games -- long enough to bind baseball's hardest throwing (and perhaps most effective) relief pitcher to the Yankees for one more season, short enough to have him available for more than two-thirds of the season. The slight return the Reds got in the Chapman trade suggests that most teams decided they didn't want the star's behavioral baggage. I also suspect most teams don't want to see the Yankees effectively rewarded for embracing him. -- for the Yankees in 2016. 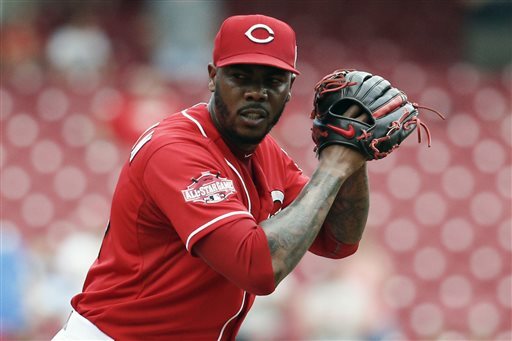 Aroldis Chapman's fastball is the stuff of legend. Example: Last season the Cuban lefty fired 452 pitches clocked at 100 mph or more; the next highest was Kelvin Herrera of the Kansas City Royals with 143. On Monday the rebuilding Cincinnati Reds traded Chapman to the New York Yankees for four comparatively unimpressive minor leaguers: right-handers Caleb Cotham and Rookie Davis and infielders Eric Jagielo and Tony Renda. None were considered to be among the Yankees' top prospects, although Jagielo did make the Eastern League (Double A) all-star team last year. The reason, of course, is the domestic violence investigation(s) involving Chapman from an Oct. 30 incident in Davie, Florida, in which it is established he fired eight shots into a garage wall. It's not the first eyebrow-raising incident involving Chapman and a woman; in 2012 a stripper was found bound in Chapman's Pittsburgh hotel room while Chapman was at the stadium. She was charged with filing a false police report; I have no idea how that all was resolved. Chapman may or may not be charged in the Florida incident. He may or may not be suspended by MLB under its new domestic abuse policy. I don't really care. I won't criticize the Twins for not pursuing a rare talent who fires a gun during an argument. There's enough smoke around Chapman's fire to decide to avoid him. The death this weekend of Dave Henderson prompted me to look back at the 1988-92 Oakland A's, a dynasty remembered mainly for its role in baseball's steroid explosion and for its continuing influence on bullpen use. "Hendu" wasn't a great player, although he lasted 14 years in the majors. He had bounced around -- Seattle, Boston, San Francisco -- for seven seasons before landing with the A's and was a full-time player in only two of those seasons. He did have some moments of high drama for the 1986 Red Sox -- his two-out, two-strikes, game-saving, series-saving, ninth-inning homer off Donnie Moore in Game Five of the ALCS about as dramatic as it gets. But still, seven years and basically a bit piece. Then he signed with Oakland as a free agent after the 1987 season, and his career changed. To that point, Henderson was a .253/.316/.429 hitter. In 1988, his age 29 season, Hendu hit .304/.368/525 with 63 extra base hits, 95 RBIs and 100 runs. It was easily the best season of his career, and even though he regressed sharply the following season, he rebounded with solid seasons in 1990 and 91 before injuries and age did him in. Henderson was Oakland's regular center fielder for four seasons, 1988-91. In those four seasons, the A's won three AL pennants and one World Series (and were highly favored to win the other two). They won 390 games in those four seasons, 306 of them in the first three, the pennant years. They were the Bash Brothers: Jose Canseco and Mark McGwire in the middle of the lineup, of course, but they also had (for a couple of years) Rickey Henderson in his second go-around in Oakland, plus Carney Lansford at third base, Terry Steinbach behind the plate, Walt Weiss at short, the aged Dave Parker for the bulk of the designated hitter duties and a rotation anchored by Dave Stewart and Bob Welch. That's a strong roster. And the bullpen. This was the team which which Tony LaRussa invented the one-inning closer. Managers had, for about a decade, been trying to restrict bullpen aces to save situations, cutting back from the almost insane workloads of the early 1970s. But most aces were still working two or even three-innings at times. LaRussa used Dennis Eckersley differently, and within a couple of years everybody else was aping him. The A's expanded the number of relief pitchers they carried to accommodate the restricted use of the closer; everybody else quickly followed suit. The rise of seven-man bullpens and multiple lefty relievers pushed platoons out of the game. Dave Henderson didn't have much if anything to do with that aspect of the Bash Brothers A's, of course. I don't know if he had anything to do with the steroid culture either. But he was a key piece of a a team that deserves to be remembered. It's a couple days after Christmas, and Rickey Henderson was born on Christmas, so it's time to unwrap a Rickey Henderson story. There is one former Twin on the BBWAA's Hall of Fame ballot this year: newcomer Luis Castillo. Castillo will be a one-and-done guy on the ballot, and that's as it should be, even if the most similar player to him in Baseball Reference's "similarity score" is enshrinee Johnny Evers. Evers was a debatable choice himself, and nobody else on the list is in, But Castillo was a fine player for a few seasons: three-time Gold Glove winner, two-time All-Star, regular on the 2003 World Series winning Marlins, two-time NL stolen base leader. Castillo played second base for Minnesota in 2006-07. The Twins picked up the second baseman from the Marlins for a pair of minor league pitchers (Scott Tyler and Travis Bowyer) who reached the majors but didn't do much, and he was a significant part of the "pirahanas" team that had such a glorious season in 2006. When the Twins fell out of contention in 2007, Terry Ryan -- in what I beleive was the last significant move he made in his first term as general manager -- traded Castillo at the deadline to the Mets for a pair of minor leaguers. Outfielder Dustin Martin never reached the majors, but catcher Drew Butera did. Butera spent part or all of four seasons with the Twins, and then they traded him (another deadline deal) in 2013 to the Dodgers for minor league lefty Miguel Sulbaran. Sulbaran finished 2013 in low A for the Twins. The next April, the Twins traded him to the Yankees for Eduardo Nunez, who remains on the big league roster as a bench piece. So a decade after the Twins traded for Castillo, the move still has a presence. The past couple of Christmas posts have taken advantage of the amusing Baseball Reference page for Rudolph the Red-Nosed Reindeer. The page has not been updated; the most recent stats for Rudolph, and the other reindeer on his powerhouse team in the Holiday League, remain 2014's. But The North Pole Reindeer's official web site reveals the new Nicholas Field stadium, reportedly on schedule for opening day 2016. Looks like a good place to watch a game. Merry Christmas, all. And thanks for visiting. I'm not a member of the BBWAA, so I don't have a Hall of Fame vote. Odds are, you don't either. But that hardly stops us from making our own mock ballot. Here, via Baseball Reference, are the players on this year's ballot. Your task, as a mock voter, is to pick up to 10. I don't have a lot of enthusiasm for Edmonds, but his stats say he's deserving. When I took a look this past year at how Torii Hunter stacked up against the enshrined center fielders, I concluded that (a) Hunter was better than a lot of them and (b) that hardly made him unique. Edmonds' stats are pretty comparable to Duke Snider's and I have no qualms about the Duke. And I'd rather vote for a career centerfielder with eight Gold Gloves than a career DH (Edgar Martinez) or closer (Lee Smith, Billy Wagner, Trevor Hoffman.) At least one of those four will get more voted than Edmonds, I'm sure, but I'll plunk my vote for the complete player as opposed to a specialist. baseball broadcast team in 2016. Fox is revamping its primary baseball broadcast team, and there are two pluses for the fans. It will be a two-man booth. Joe Buck will remain the play-by-play guy, and other than the fact that he's on record as preferring to call football games, that's OK. There are better play-by-play announcers, but Buck's a pro. I'm a little sorry to see Tom Verducci bounced, but my regrets there are mainly theoretical. He might do well in a two-man booth, but he was stuck splitting time with Reynolds, and nobody was going to shine under those circumstances. Reynolds will drag anyone down to his inane level. And Fox simply isn't creative enough to break out of the the "we gotta have somebody who played the game in the booth" mold. Monday's post, which made some assumptions about the Twins 2016 bullpen, made no mention of Fernando Abad, a veteran lefty reliever signed as a minor league free agent. Abad may well be the front runner for the vacant slot in my rough draft, but since he's not on the 40-man roster, he lacks the presumption that graces the likes of Casey Fien. He throws a change up. Pitching coach Neil Allen is well-known as an advocate of the change, but this facet of Abad's repertoire matters beyond Allen's pitch advocacy. Remember: Terry Ryan has said he's not interested in a left-handed specialist. He wants a lefty who can get right-handers out as well. As a general rule, lefties who are death on left-handed hitters rely on a breaking ball to complement the fastball; lefties with reverse platoon splits use a changeup. Abad, according to the data published in the Ball James Handbook, threw about as many changeups (13 percent of his pitches) as curve balls (12 percent). (He was 55 percent fastballs and 20 percent cutters). That's not the sort of ratio one expects to see from a LOOGY. My bias is toward giving one of the inexperienced pitchers a shot at the job. But Abad appears to fit the general outline the Twins have for a bullpen lefty. The Twins have discarded, at least presumably, a few arms from the 2015 bullpen. There appears to be little interest in bringing back Brian Duensing and Blaine Boyer, although neither has signed elsewhere. They supposedly have some interest in Neal Cotts, not that I could explain why he rates higher with them than does Duensing (perceived salary might be part of it). 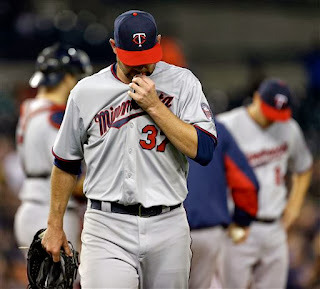 And the word last week what that, while Trevor May is supposed to prepare for spring training as if he's a rotation candidate, the bullpen is a likely destination. This dismays some; I see it as the inevitable result of (a) all the mid-to-back-of-the-rotation veterans clogging the roster and (b) May's own inability as a rookie to get through the sixth inning. Assume that May's in the bullpen, Further assume good health. Further assume that the Twins open with a six-man bullpen (although they likely will expand that to seven before June). What's the 2016 bullpen look like as matters stand? Nolasco in the pen presumes a rotation (listed alphabetically) of Tyler Duffey, Kyle Gibson, Phil Hughes, Tommy Milone and Ervin Santana. It also appears to squeeze out J.R. Graham and Ryan Pressly, among others. If this is the case, there's only one bullpen job open, which would presumably go to a lefty, be he veteran or prospect. Terry Ryan has said repeatedly that he's not after a specialist, that he wants someone who can face right-handers as well. Which, for all the rumors about veteran free agents Matt Thornton and Craig Breslow, suggests to me that the flock of left-handed pitchers the Twins added to their 40-man roster last month will get a serious examination in Fort Myers. Logan Darnell, Pat Dean, Tyler Rogers, even Randy Rosario (who spent 2015 in low A ball) all started in the minors. If the Twins are serious about wanting that pitcher to be able to do more than get one left-handed hitter out with men on base, a minor league starter might be the way to go. "On this particular night, we had been accusing the Milwaukee pitcher, Lou Burdette, of throwing spitters, and the umpires -- who knew Burdette was throwing spitters and also knew that they weren't going to do anything about it -- had ordered us to shut up. "Who me? I didn't say nothing! "I'm out of the game, and Frank is on the floor, laughing." Last spring Shane Robinson made the Opening Day roster as a non-roster invitee to spring training and stuck all season. He's going to try to do the same thing with Cleveland in 2016. Meanwhile, the Twins have a handful of outfield hopefuls coming to camp as non-roster guys, including former Twins Joe Benson and Darin Mastroianni, plus veteran Ryan Sweeney. Sweeney is a former second-round draft pick out of Cedar Rapids, Iowa, who has nine seasons in the majors on his resume. The Cubs released him on April 7 last year, eating $2 million on his contract, and he didn't play anywhere after that. He's a left-handed hitter with some size, 31 in February, who has gotten a considerable amount of his playing time in center. He has the resume and profile of an established fourth outfielder, but his absence from the game last year is a red flag. It's not so much that the Cubs dropped him; with all their young talent, that was explicable. That nobody else picked him up makes me wonder. Still, if one of these NRIs makes the team, Sweeney's my bet. Benson I discussed in a previous post. Nothing's happened since to change that assessment. Mastroianni spent 2015 in the minors, starting in the Phillies system, then moving to the Nationals. His Twins tenure was marred by a foot-ankle injury that took the edge off his best tool, his speed. All three of these guys face the same significant obstacle: lack of opportunity. The Twins have a corps of talented young outfielders at or neat the big league level, and some of them (Oswaldo Arcia and Danny Santana) are out of options. That, I'm sure, is why Robinson is trying his luck elsewhere. This figures to be a tough nut for a non-roster guy to crack. The Twins on Thursday announced 22 non-roster invitees to spring training. Some of the names are big prospects who are't on the 40-man roster: Jose Berrios and Nick Burdi, Some are roster fillers for the upper levels of the minors. A couple -- left-handed reliever Fernando Abad and veteran outfielder Ryan Sweeney -- were fresh minor-league signings who may have legitimate chances to make the active roster. And, as always, there are plenty of catchers on the list, five to be exact. There are also three catchers on the 40-man roster, so the Twins will have eight catchers in camp. The reason, of course, is to have plenty of backstops to be on the receiving end of dozens of bullpen sessions. The catcher list always intrigues me, partly because most of them have to know that they're just there for the bullpen sessions. Barring injury, we know that Kurt Suzuki and John Ryan Murphy will be on the 25-man roster, and the other six will not. But they get major-league per diem while they hang around camp, and they are jockeying for position in the upper levels of the system. The Twins have been big in recent years on hyphenated catchers. Herrmann was a catcher-outfielder. Grimes was a catcher-middle infielder. Rohlfing played a lot of outfield and first base. This seldom made a lot of sense to me. Most catchers are too slow for the other up-the-middle positions, and hit too lightly for the corner positions. This spring's eight catchers includes one multi-position guy, Alex Swim. Last season, at Fort Myers, he played 30 games at catcher (Garver was the primary catcher), 24 at first base and 16 in right field. He also hit .311, which is also the batting average he put up in Cedar Rapids the year before. But the batting average is about all he has. He has three minor league seasons on his resume, more than 700 at-bats, and has yet to hit a homer. He turns 25 in March and hasn't gotten out of A ball. 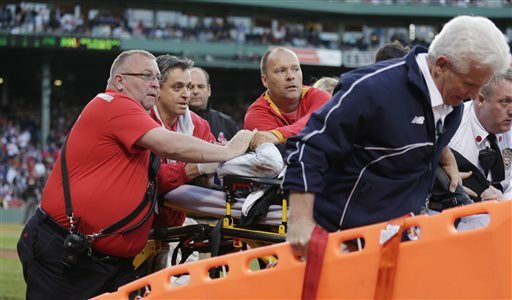 An injured fan is carried out of Fenway Park last season. There were a number of frightening incidents during the past season of broken bats or line drives injuring fans sitting in the dugout areas. Last month, Commissioner Rob Manfred strongly encouraged teams to widen their netting to protect more fans. And this week the Twins announced that they would extend the backstop netting to behind the dugouts. There is already pushback on social media from fans who don't want to be behind the screen. I understand that. I have been in behind-the-dugout seats in the past, and reveled in the proximity to the action. But I've also seen fans bloodied by balls, and it wasn't a simple matter of "you gotta pay attention." The dugouts at Target Field are the closest to the field in the league. Some of the seats are closer to home plate than the infielders are. There is genuine danger that close, and most of us don't have the reflexes of a major league infielder. And, you know, I've sat behind a backstop and netting before. It doesn't take long before you ignore it. Wider screens are wise. Max Kepler had a breakout season in 2015. The German was named player of the year in the Southern League with a slash line of .322/.416/.531 and ended the season with a seven at-bat cup of coffee in the majors. And there is no obvious place for him in the Twins plans. The Twins have Eddie Rosario in one outfield corner and appear intent on putting Miguel Sano in the other. Byron Buxton, a brighter prospect than Kepler (which is saying something) ought to be ahead of Kepler for center field. Joe Mauer and Byung Ho Park have first base and designated hitter occupied. There is no immediate urgency to finding a place for Kepler. He turns 23 in February and hasn't played in Triple A yet; a month or three in Rochester might be a good thing for him. But I fully expect that he'll be ready for the Show somewhere around the All-Star break. I am less certain that the Twins will be ready for him. Here's the thing: Pete Rose is old. I don't know why that surprises me -- the man won his second batting title the year I became a fan back in 1969 -- but it does. Somehow, my sense of time evaporates with him, and he is forever slamming into Ray Fosse in the All-Star Game or dribbling the baseball on the artificial turf at the end of an inning. But he's 74, turns 75 in April. His time as a potential manager or general manager has passed. Which makes Monday's announcement by Commissioner Rob Manfred continuing Rose's lifetime ban essentially irrelevant. Even had Manfred lifted the ban -- and given Rose's continuing wagering on baseball, that was not going to happen -- I cannot imagine a team, even the Reds, giving Rose a significant job in baseball operations. Not at his age. Not as out-of-touch with today's game as he proved himself to be in his postseason studio commentary in October. The Pete Rose of today brings nothing that will help a franchise win now or in the future. Ah, you say, but that's not the point. The point is the Hall of Fame. Rose's ban means he's barred from induction, and he's the career leader in hits. Can't believe Major League Baseball just rejected @PeteRose_14 for the Hall of Fame. He's paid the price. So ridiculous - let him in! Trump here echoes a common misunderstanding. (There are a lot of things the Donald doesn't understand, or perhaps doesn't care to reveal that he understands, and this is one of them.) Major League Baseball and the Hall of Fame are different entities. They're intertwined, certainly -- Manfred is a member of the Hall's board of directors -- and the Hall likes to have MLB happy with it. but it is not the commissioner barring Rose from the Hall. It;s the Hall of Fame's decision. Indeed, Manfred's ruling contains a paragraph explicitly separating the two issues. His ruling is that Rose is too likely to continue to violate Rule 21 -- the ban on gambling on baseball -- to allow him to play an active role with any team. That's a separate issue from the Hall of Fame. b) the Hall is going to remain reluctant to honor a man baseball cannot trust. Twins in one of his stints at second base. Michael Cuddyer announced his retirement as a player during the weekend with this piece on the Players Tribune website. Cuddy is walking away from the final year of the two-year contract he signed with the New York Mets and giving up some $12 million, which probably should tell us how much his body hurts. He hasn't had a season without a DL visit since 2010, and he was obviously struggling in the postseason last October for the Mets. Fifteen seasons major league seasons, seven trips to the playoffs, two All-Star teams, one batting title (with the Rockies), one 100-RBI season (2006), one 30-homer season (2009), seven positions (all but shortstop and catcher). Not a bad run at all. He gave the Twins -- once they gave the former first-rounder a shot at regular playing time in the last half of the 2000s -- some right-handed thump to counterbalance a very left-handed lineup. He played at seven positions, none of them at a high level, but well enough not to be a significant hindrance. 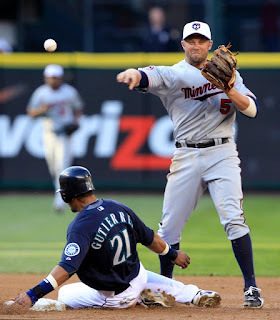 One of the great "what ifs" of the Ron Gardenhire era: What if Gardy had followed through on making Cuddyer a second baseman? When Gardy experimented with him there, it was easy to imagine a new Jeff Kent -- lacking in range but making up for it in other ways. My guess is that Gardenhire shied away from the idea because Cuddyer didn't fit the stereotype for the keystone. And perhaps the manager was right. But second base was pretty much a revolving door for the Twins during the years of Cuddyer in right field. What next for him? I have long believed that he can/will be a major league manager -- if he wants that kind of job. Broadcasting is also a possibility. But he's made some $80 million playing ball, according to Baseball Reference, and if he just wants to hang with his family he can do that too. Dave Bristol who managed four teams from the mid 60 into the 1980s, was one of those baseball lifers seldom seen without a chaw in his cheek. Nor was he apologetic about that. Said Bristol: "The only trouble I ever had with chewing tobacco was that the orthodontist said my daughter was going to have to give it up because of her braces." A year ago I mentioned on occasion a Strat-O-Matic Baseball project I was starting: A 64-team tournament of seven-game series involving teams from 1969, 1987 and 2009. That project is over. And while I won't impose the details of the "40-Years Tournament" on you here -- nothing is as boring as somebody else's fantasy league -- the project has led to some posts on general topic, such as the decline in infield errors in the past half-century and the falloff in innings by starting pitchers. Another concept this project reinforced for me: The capriciousness of the seven-game series. The lesson isn't a new one; it's more reinforced than taught. The more MLB stacks up its postseason series, the less likely it is that the truly best team will emerge as the winner. The difference between the good teams and the bad teams really isn't all that great. It takes months for the gap to show. The Twins' only transaction during the winter meetings was losing minor league reliever Zack Jones in the Rule 5 draft to the Milwaukee Brewers. (Baseball Reference may have his name with a "h," but he uses a "k.") He's a high-velocity right-hander who put up a 6.00 ERA in Double A last summer. Miguel Sano has left his winter league team, for whom he was playing third base and designated hitter, to focus on his conditioning and shift to the outfield. He is said to have ended the season at 268 pounds; the goal is to get him under 260. Again, this suggests that the Twins are serious about making Sano an outfielder, and that he's serious about giving it a genuine shot. Another factor in this: Oakland is apparently eager to trade Brett Lawrie, a very comparable third baseman. If the Twins were pushing for a Plouffe trade, the immediate effect would be a buyer's market. Taking their time on moving Plouffe, assuming they want to, might well be the best tactic. It's certainly plausible that the Twins took a quick read of the third base market, realized that there wasn't going to be much of a market for Plouffe, and decided to try to make a virtue of necessity. Still, I suspect the Twins would be better off with Sano at third and either Max Kepler or Oswaldo Arcia in the outfield than with Sano in the outfield and Plouffe at third, even if they got zilch for Plouffe. Here's an amusing (to me at least) sidelight to the Lawrie trade: As of now, it makes Danny Valencia the A's third baseman -- the same Valencia who lost the Minnesota third base job to Plouffe. Shuffle and deal, shuffle and deal, and the same cards keep showing up. The Twins have been on the sidelines through the first two days of the Winter Meetings -- no trades, just talk and some indications. Indication One: Reluctant as I am to accept this, the Twins are certainly behaving as if they are serious about this Miguel Sano-to-the-outfield concept. Reports out of Nashville indicate that the Twins will listen to trade offers for Trevor Plouffe but aren't showing any urgency about moving the veteran third baseman. Indication Two: Brian Duensing and Blaine Boyer, two free agent relievers who between them made 123 appearances for the Twins last year, won't be back. The Twins are, however, interested in bringing back Neal Cotts. As lefty relievers go, I'd probably prefer Duensing to Cotts, but Duensing figures to be the more expensive of the two. Indication Three: Minnesota's top focus so far is said to be relief pitching, particularly left-handed, but there is also chatter that the Twins are shopping Ricky Nolasco. It's a good guess that moving Nolasco will either require the Twins to take on somebody else's bad contract or hand over a chunk of money to cover Nolasco's remaining years. Or both, Dumping Nolasco looks like addition by subtraction at this point, however. The Twins need to clear some rotation space. Indication Four: Unless something happens today, the Twins will sit out the Rule 5 draft on Thursday. They have a full 40-man roster. They have seldom skipped Rule 5, but this year may be the exception. Last night, Danny Santana started at 2B for the 7th straight time. He's now started 8 games at 2B, 7 in CF and 1 each at SS, RF and DH. That kind of versatility figures to be vital for Santana. Like Oswaldo Arcia, Santana is out of options. His best shot for a major league career at this point appears to be as a utility player. Unlike Arcia, he has the multiple tools to apply to such a role. He can run, throw and switch hit, although I don't think he can hit enough to be a Ben Zobrist-type of utility regular. For what it's worth, Terry Ryan indicated on Monday (the first day of the winter meetings) that acquiring a fourth outfielder is on his agenda, if not at prominently as adding to the bullpen. Ryan and Company love their proven veterans, but considering how stubborn they've been about Santana's talent eventually emerging, I would think Santana would be more prominent in their thinking about that bench spot. It's even possible that the Twins might open 2016 with Santana in their outfield on a regular basis. That would probably mean sending Byron Buxton to Rochester and deciding that they can't afford to have both Arcia and Sano in the corners. But even if that's the route they go in April, it won't last long. disabled list, and went 11-27, 4.94. This got him a sizable raise. There has been quite a few eye-popping contracts for free agent pitchers in the past few days. Mike Pelfrey's two-year deal at $8 million per with Detroit is far from the richest of them, but it's noteworthy in its own right. Big Pelf is a back-of-the-rotation arm who has qualified for the ERA title once in the past four seasons,which he did with two innings to spare last season. He did go at least seven full innings in 10 of his 30 starts for the Twins; he also had 10 starts in which he didn't work five full innings. I expected his departure but was nevertheless half afraid that the Twins would re-sign him. They don't really have any place to put him in their rotation, but that doesn't always stop their decision makers. Avila on Pelfrey: "I'm not going to throw our analytics guys under the bus. This wasn't an analytics signing, it was a scout signing." Avila, to be clear, is the Detroit general manager. And yeah, I'd bet there isn't an analytics department in the game that recommended signing Pelfrey. Scouts see a moving fastball with velocity; the stats show a one-pitch wonder with a dismal strikeout rate. There's a line of thought that Pelfrey would be a better fit in a relief role. He's resisted that notion in the past, and it appears that the Tigers view him as a starter. Which, as a fan of a divsion rival, suits me just fine. Dan Quisenberry, the ace reliever of the Kansas City Royals, in the mid 80s signed a complicated "lifetime" contract tied to the real estate developments of a Royals co-owner. But soon after he signed the lucrative deal, his manager lost confidence in him, and he fell into disfavor and disuse. One day Donald Fehr, then the head of the Players Association, was visiting the Royals clubhouse, and Quis casually asked him if he had any recourse if the Royals continued to refuse to pitch him. "Well," Fehr said, "you could always buy them." to play in Asia next year. Oswaldo Arcia didn't sustain a career-threatening injury in 2015. But he damaged his career enough to threaten it. Arcia is out of options now, and in my opinion should have been waived to clear room on the 40-man roster. I think he would have cleared waivers; if not, let somebody else carry him on their 40. The Twins are being more patient than that, but the rules limit their patience; he either makes the 25-man roster out of spring training, or gets waived then. By now you know his pluses -- genuine power from the left side of the plate, and he doesn't turn 25 until May -- and his considerable minuses, which are pretty much every other aspect of the game. He's a horrid defensive outfielder, doesn't run the bases well, hasn't hit lefties at all, can't or won't adjust as a hitter, has displayed poor strike zone judgment. He's best suited to being a platoon DH, and that doesn't work when half the roster consists of pitchers. Despite all that, he's got a genuine chance to revive his Twins career in 2016, but he probably needs some help. Sano might not become an outfielder. Buxton might be sent to Triple A. Take either of them out of the equation, and Arcia's current outfield competition dwindles to Danny Santana and Max Kepler. Kepler is more likely to get sent to Triple A than Buxton is, and Santana's status isn't much better than Arcia. The help Arcia needs to get another genuine opportunity with the Twins is a Trevor Plouffe trade. That would take Sano out of the outfield picture. Even if Buxton is, as I think he should be, the center fielder on Opening Day, that still leaves a regular outfield job open. One can even imagine a scenario in which Plouffe isn't traded, Buxton and Kepler are sent to the minors, and the Twins torture their pitching staff with an outfield of Arcia and Sano flanking Rosario in center. I think it's unlikely; Paul Molitor might be willing to have one defensively challenged outfielder in the lineup, but not two. Even if Arcia opens the season in the lineup, I expect it will be short-lived. Kepler is a better long-term bet than Arcia is. The blunt truth is, the Twins have many better alternatives for their outfield. Byron Buxton remains, by the slimmest of margins, officially a rookie in 2016. He's likely the early favorite to be Rookie of the Year next year. Assuming, of course, that he plays. The trade of Aaron Hicks opens center field, and Buxton is presumably the front-runner to claim the job. But he didn't hit in his limited major league duty in 2015, and it's possible the decision makers will opt to give him some Triple A time to start 2016. I wouldn't. Between his undeniable ceiling and his defensive prowess, I'd rather have him in center field from the get-go in April. The alternatives at this point are Eddie Rosario and Danny Santana. Rosario is better suited for a corner outfield spot, and there is nothing Santana does as an outfielder that Buxton doesn't figure to do better. -- at a press conference Wednesday. 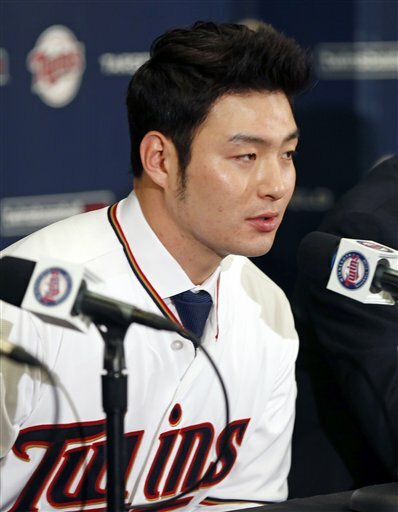 The Twins trotted out Byung Ho Park on Wednesday morning for his introductory press conference. All the standard things were said. Terry Ryan repeated that Trevor Plouffe will be the third baseman next year and that Miguel Sano will be in the outfield. I continue to be skeptical. The Twins filled out their 40 man roster on Wednesday by picking up catcher John Hicks on waivers from Seattle. His record says he's a poor hitter, but his caught stealing rates are pretty impressive, and he apparently has options left, so he can be readily sent to the minors. More catching depth! The Twins added a good-catch, no-hit receiver in Juan Centeno on a minor league deal earlier in the week, so they are stockpiling quite a few of these guys. I had presumed that Stuart Turner, who also fits that mold, was going to be the primary Triple A catcher this year; now I'm not so sure about that. Or perhaps they are setting themselves up to move Kurt Suzuki, I don't expect that; I can't imagine that there's much to be gotten in a trade for Suzuki, But I can't dismiss that possibility now. Wednesday night was the deadline for tendering contracts to arbitration eligible players. The Twins had six such, and they retained all six. No real surprise, although I wouldn't have been too surprised had they non-tendered Eduardo Nunez or Casey Fien. Among players who were cut loose by teams Wednesday night were a pair of big-power first basemen with a lot of swing-and-miss to their games, Chris Carter (Houston) and Pedro Alvarez (Pittsburgh). They are, to some degree, what I expect Park to be. Presumably the Twins expect Park to hit for a better average than those two, but he's going to strike out a lot. Park's also a year older than Carter and Alvarez. As we gauge how the Korean fares in American ball next year, Carter and Alvarez might be interesting yardsticks. The Twins made it official Tuesday: Korean slugger Byung Ho Park has signed a four-year contract with a fifth-year option. It's $12 million guaranteed and a max value, apparently, of $22 million. $12 million is a lot of money to me and probably to you, but is maybe half of what was generally expected. #Twins’ signing of Park reinforces unfairness of posting system. Player has no leverage if he burns to play in majors. At MLB team’s mercy. He may well have gotten more in a free market, but it wasn't a free market. The Twins may have lowballed him, but that's happened to players entering pro ball for generations. Park is hardly a sure bet. Behind his big home run totals in Korea are some equally big strikeout rates. His contract is roughly the same as that of Jung Ho Kang, who came over from Korea to have a very strong rookie season for Pittsburgh, but the Twins paid more than twice what the Pirates did for the posting fee. If he turns out to be merely an average 1B-DH, this contract is a bargain. If he turns out to be better than that, it's even more a steal for the Twins. And if he turns out to be a complete bust, this contract is digestable in the context of a $100 million payroll budget. ROSTER MOVES: The Minnesota Twins have signed OF Joe Benson, C Juan Centeno and LHP Aaron Thompson to minor league contracts. Centeno is next year's version of Eric Fryer, catching depth. Thompson we saw quite a bit of early in 2015; if he's in next spring's bullpen, I will view it as a bad sign. And Benson is sort of the prodigal son returning. Around the time the Twins experenced their big collapse, Benson was viewed as a hot outfield prospect. Big, strong, fast, dripping with tools. But his career ran aground on injuries and his chronic inability to control his strike zone. The Twins waived him after he didn't make the team in 2013; he finished that season in the Rangers system. He spent 2014 in the Marlins system. 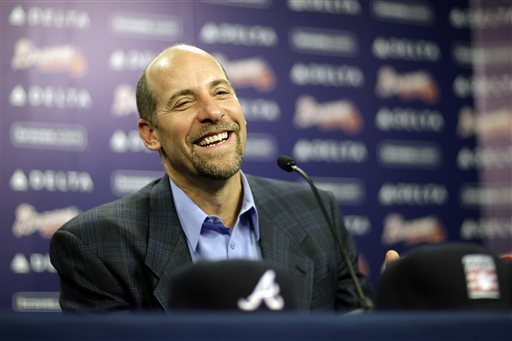 He split 2015 between independent ball, the Mets system and the Braves system. He'll turn 28 in March, and he hasn't been back in the majors since his cuppa coffee in September 2011. Despite a little Twitter chatter Monday afternoon about his chances of landing the fourth outfielder job, I don't see much chance for him this year either. Benson's biggest problem: So much of hitting depends on the batter's ability to decide, practically as the pitcher releases the ball: Strike or ball, what's the velocity, hittable or not. He just doesn't have that ability, and all the other athletic tools are wasted by that flaw.